The 'Handbook for developing Visions in MSP' was developed as one of the three tasks of the MSP Platform Technical Study ‘MSP as a tool to support a sustainable Blue Economy’ carried out under the European MSP Platform. The purpose of the Handbook is to assist planners in developing a maritime vision or a strategy, as well as assisting those who wish to prepare the terms of reference for facilitating a vision process. The handbook provides quick and easy access to relevant tools and methods, building on lessons learnt from vision development processes across Europe. It indicates a range of possibilities for working with visions, showcasing options and ideas, rather than being prescriptive. What is the relationship between visioning and MSP processes? How to do a background research for the visions development process and involve relevant stakeholders? How to develop scenarios and ensure their effective presentation? How to identify, analyse and engage stakeholders in the vision development process? How to effectively communicate the vision development process and disseminate outputs ? Which case studies can provide good practices and lessons learned for the vison development process? The Handbook can be used for the maritime vision that is being developed as part of MSP processes, or initiated separately. While MSP is normally revised and adapted every 6 years or less, visions usually have a long-term perspective, beyond 10 years. A shared vision can supplement an MSP with a long-term perspective by considering the evolution of key maritime sectors beyond this 6-year MSP framework. Unlike the development of a maritime spatial plan, the development of a maritime vision or a strategy is not an obligation under the EU law and is usually developed on a voluntary basis. There are many variations of visions processes, with regard to their purpose, methods used, presentation of results, and other aspects. They also differ in their geographical scale, initiating organisations, relationship with MSP and actual decision-making processes. Spatially mapped visions are usually more useful in an actual MSP process than non-spatial examples, usually because they concentrate on the spatial implications of possible changes or show the spatial consequences of future sea use trends. The development of a vision or strategy can define relevant concepts as part of the MSP preparatory phase (e.g. maritime space and the use of maritime space), prepare stakeholder input to MSP, help define priorities in maritime spatial plans and set out general planning principles. Maritime strategies can also provide a legal framework, and thus a high level long-term certainty for the planning process. The aim of the 'Handbook for developing Visions in MSP' is to assist planners in developing a maritime vision or a strategy, as well as to assist those who wish to prepare the terms of reference for facilitating a vision process. A vision can be developed with different objectives in mind and for various purposes. The vision process presents a mechanism for stakeholder engagement and facilitates dialogue on a joint future. It can serve as a ‘warm-up’ for an MSP process, encouraging stakeholders to start thinking outside of their sectoral interests, to consider longer time scales and to stimulate questions on “what if?”. The final document can also be very important, for example, if it documents statutory norms and principles. Depending on its ultimate purpose, the presentation of visions also varies greatly, from philosophical and artistic descriptions of the future to presentations of quantified analyses. achieving better land-sea integration of planning. 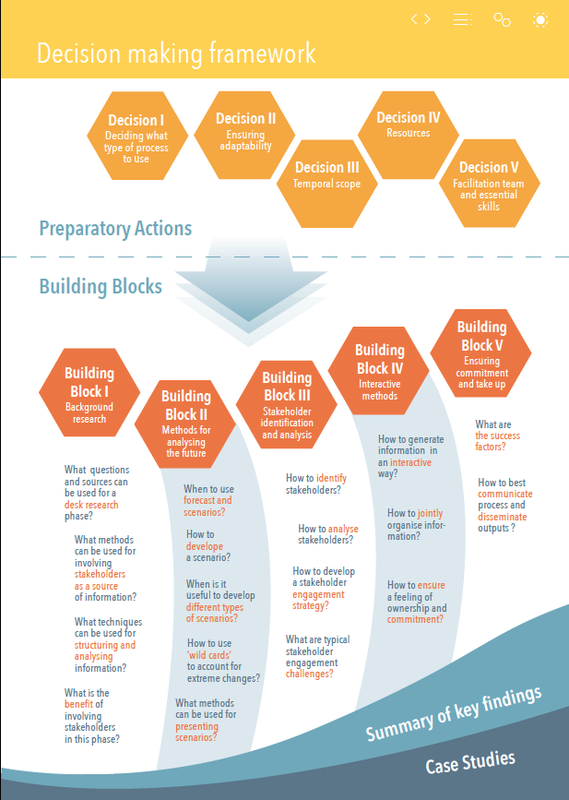 second level decisions, herein 'building blocks' relating to possible tools & methods that can be used in the processes. To develop a maritime vision, planners need to understand many underlying factors and make a number of interrelated decisions. Planners are sometimes limited by certain pre-conditions that are beyond the planner’s control, such as geographical scope of the process or the statutory nature of the process. On the other hand, certain decisions are within planners’ purview. The handbook provides suggestions for some of the first decisions (herein 'First-Level Decisions') that planners need to make at the preparatory stages of a vision development process. These relate to defining temporal scope, skills and resources to be used in vision development process. The handbook also provides multiple options for steps and elements that serve as 'Building Blocks' of the vision process, including background research, stakeholder engagement and future trends analysis. Apart from experiences from the relevant vision processes from accross EU, some tools and elements from other relevant fields (i.e. sectoral planning, ecosystem-based management, urban planning) are also presented here. This handbook is designed to provide quick and easy access to information. Readers are encouraged to skip through the handbook and read about the tools and methods that interest them the most. The handbook also provides a variety of case study examples and suggests other handbooks and reading material that can be relevant in each of the steps of the vision development process. The handbook contains a wide variety of tools and methods that are applicable to a wide range of processes, including not only visions developed on different spatial and government levels, but also to MSP process, or sectoral strategies, development strategies, or any other forward-looking process. However, the choice of specific tools or a method will depend on the overall aim of the process. The examples and case studies provided throughout the handbook aim to aid this decision. The handbook itself showcases elements from urban planning, sectoral business scenarios, social science, and other processes, as these elements were identified as potentially transferable to the MSP context.